B.L. Myers Bros. has state-of-the-art equipment and services in air vacuum excavation systems. Now we can punch out more potholes faster, in harder soil, than ever before with the world’s most powerful air vacuum excavation system. The high-velocity, supersonic air that explodes the soil from within for easy vacuuming and quick backfilling. 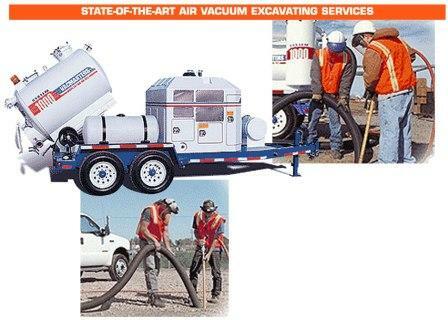 Vacuum excavation utilizes a high pressure air or water stream to penetrate, expand and break-up soil. Loose soil and rocks are simultaneously removed by a vacuum. This technique is typically used to create a hole one to two feet square and as deep as required to expose the buried utility. When utilized properly the method is a safe, non destructive means of excavation.